This is just the natural progression in the life of Salted Caramel Sauce. When you think of caramel sauce, you think of apples. That’s just given. Nothing goes hand in hand like those two. Just like cookies and milk, fish and chips, peanut butter and jelly, razzle and dazzle, itchy and scratchy…..you get the point. 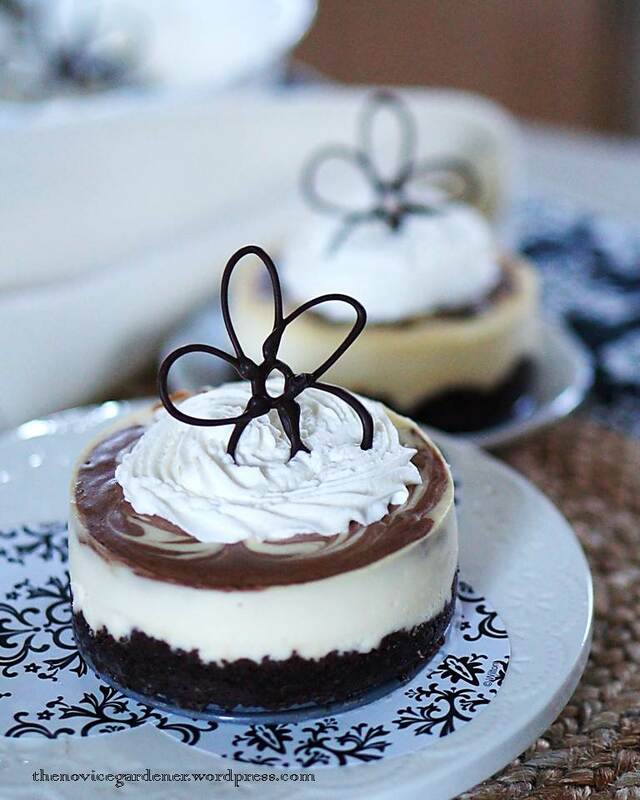 Is that a fly on my cheesecake? After dinner and a movie, we came home with a store bought cheesecake, so we could relax and enjoy dessert at home. I had it sitting on the countertop while making coffee. Just when I was about to serve it, I saw the fly, digging in on the cheesecake. My daughter saw it, too. We let out a collective gasp, a disgusted and disappointed gasp. It must have been walking all over the cake, eating as much as it could take. It wasn’t even moving when I picked it up with a napkin. Maybe it was actually already dead? Hitchhiking all the way from the store? I don’t want to know. Who would want to eat the cake? The kids had both retreated to the den and started playing video games, no longer interested in dessert. The husband said he would eat it if I would nuke the germs in the microwave first. What? Microwave a cheesecake? That’s crazy! Nope, the cake belonged to one place and one place only, the trash can. Good bye! Now, we were cheesecake-less. We each had a chocolate biscotti (biscotto?) instead. And I looked at those biscotti and I still wanted cheesecake. So the very next day, I made these. I’m a pretty stubborn woman. I’m not going to let a fly spoil my plan to have a cheesecake! There’s nothing wrong with full-fat ingredients. I routinely cook with them. But this is an experiment to see how far I can make my recipe as low-fat and healthy as possible without sacrificing taste. I consider it a success, judging from the non-existence of complaint coming from the husband, who loves cheesecakes. However, for those of you who prefer the “real deal” (not that the low-fat version is not real), I have my full-fat recipe, following this one. 2. Mix biscotti crumbs with coconut oil. Press onto bottom and up to 1/2 inch of the sides of a greased springform pan. Don’t worry about making the crust lined up evenly on the sides of the pan. I actually like the unevenness of it. Looks more artistic. Chill crust in the fridge while making the filling. 3. Mix softened cream cheese and yogurt. Add agave nectar/honey/sugar and beat until blended and smooth. Add egg, vanilla, and cream, and mix on low speed, just until well blended. Don’t overbeat. Pour over crust. 4. Bake for 25 – 30 minutes. Cool completely before serving. 5. 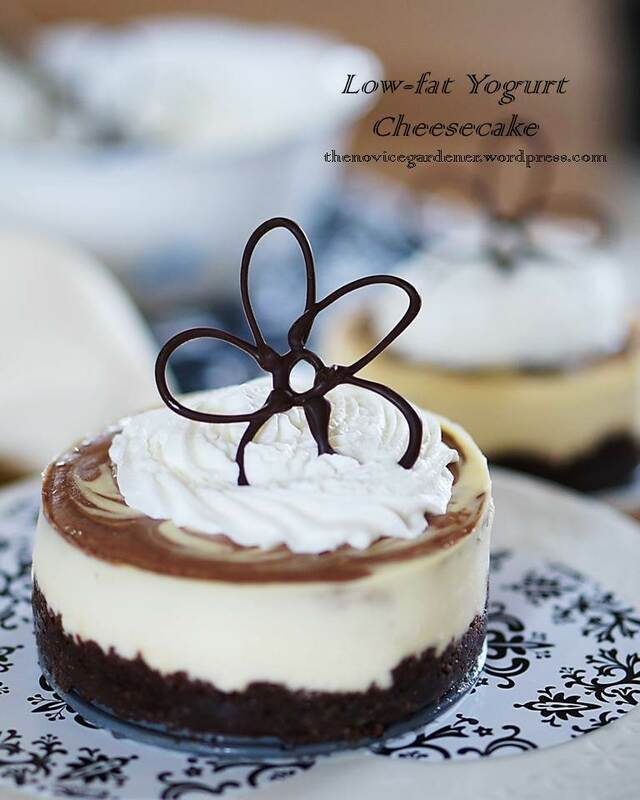 Makes 2 (4-inch) small cheesecakes, which are more than enough for 4 people. For every package (8 oz.) of cream cheese, use 1/4 cup sugar, 1 egg, and 1/3 cup of whipping cream. Follow the directions for the low-fat version. Melt 1 tbsp. of baking chocolate morsels, and mix with 2 tbsp. of cheesecake mixture. 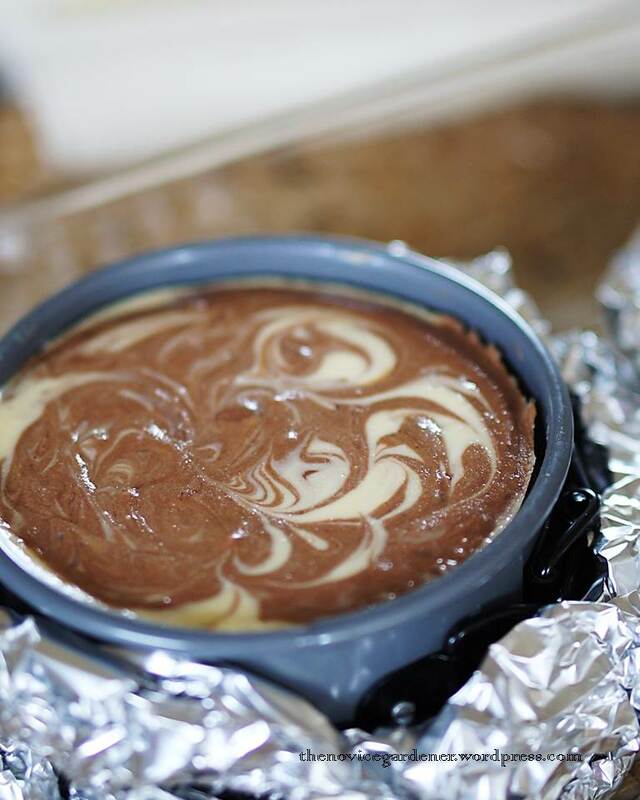 Drop small amounts of the chocolate mixture on top of cheesecake, and using a bamboo skewer, make swirl designs. Apparently, there’s such a thing as over-swirling, just like what I did on this one. 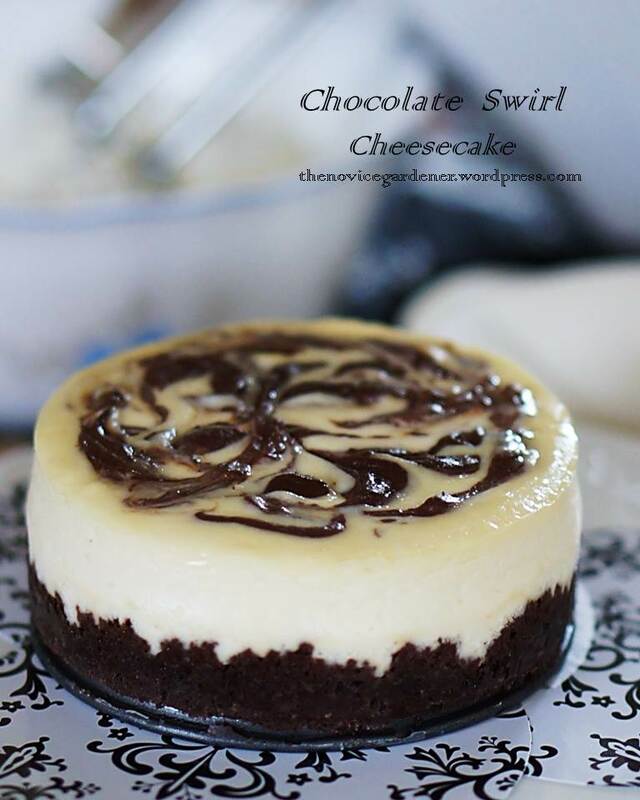 You get a big blob of chocolate-colored cheesecake instead of a pretty chocolate-swirl one. So, don’t do what I did. 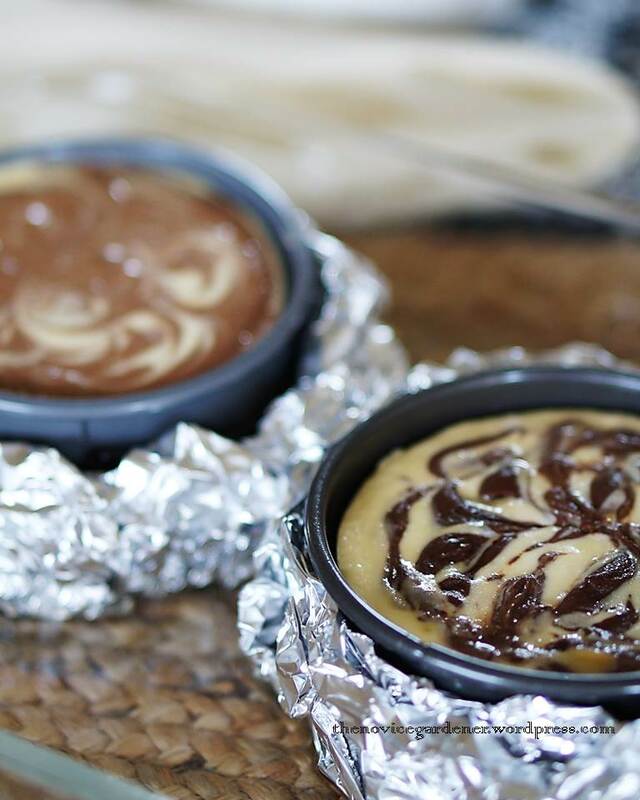 Don’t over-swirl. If you do over-swirl, don’t worry. There’s nothing that whipped cream can’t hide. And then, you can decorate the top with chocolate flowers to make it even prettier. 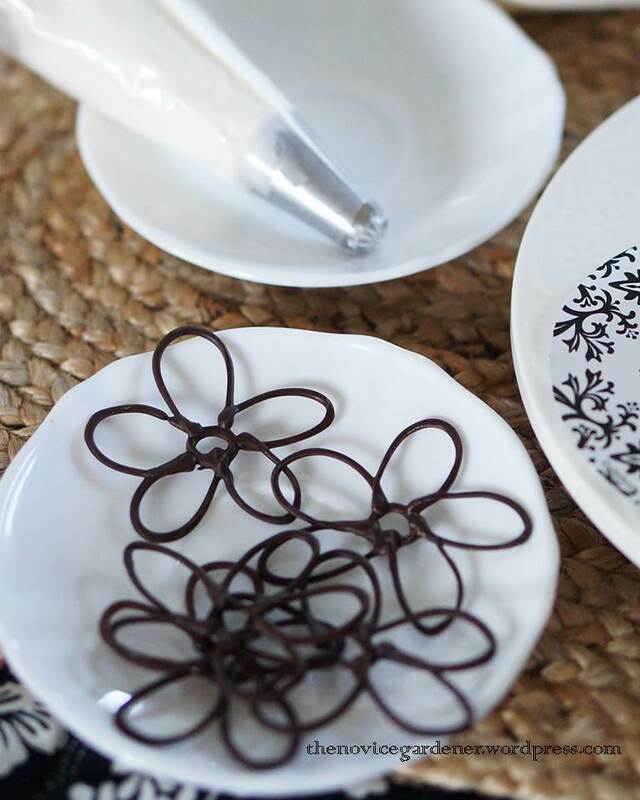 Follow the directions for making chocolate spider webs, to make these flowers. Just draw flowers instead of webs. Steady hands are helpful, and strangely, I find that going fast instead of slow, make it easier. 1. To avoid cracks or cheesecakes caving in, don’t overbeat. In fact, I like mixing my cheesecake batter by hand, with a fork, instead of electric mixer. It’s easy to do when making a small amount for a small cake, and when all the ingredients are brought to room temperature. 2. Do not insert a toothpick or a skewer to test the doneness of the cake. Lightly tap the side of the pan with a wooden spoon instead. It’s okay for the center of the cake to jiggle slightly. It will continue to set and firm up while it cools. 3. Baking the cake in a water bath does help considerably in preventing cracks. If springform pans are used, make sure to line the bottom of pans with a double layers of aluminum foil, to prevent water from seeping in. That’s it! It’s really not that hard to make cheesecakes. Give it a try, low-fat or full-fat, the choice is yours. The pretty cakes, sans fly, one more time.